The Modern Oracle is an easy to use deck that is appropriate for all levels of experience. This vibrant deck of cards deliver a modern twist providing practical guidance and clarity in the world of today. These cards are a great tool for developing your intuition as they feature clear textual cues as well as beautiful imagery. The Modern Oracle is for the Psychic of today and those seeking guidance. 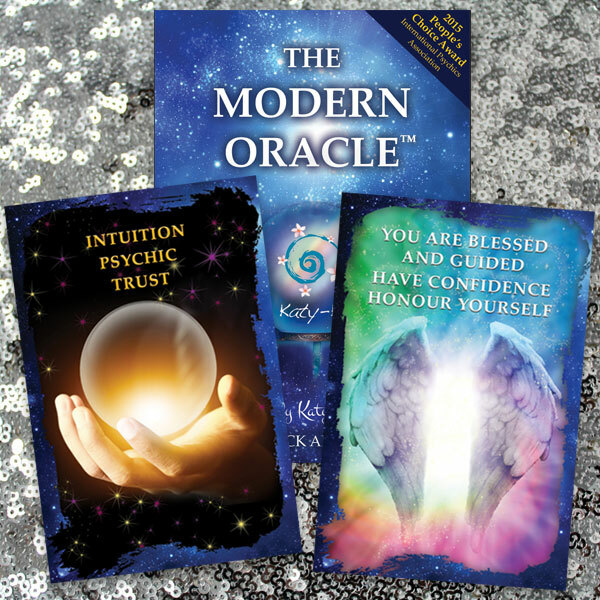 Katy K is an Australian born Psychic Medium and Spiritual development teacher who is Internationally trained. A special delivery today! I got to see Katy-k’s gorgeous new deck ‘The Modern Oracle’ before she did, so I’ve given them the once over. It is obvious that a ‘reader’ created this deck. The cards are the perfect size for shuffling and fit easily into your hand, the sturdy box and magnetic seal will keep them safe between festivals, and there are key words on the cards as prompts. Plus, they gave me a really nice message. My three cards: Wishes, Study and Innovation. Thanks Katy! Amazing deck of oracle cards. Beautiful, high quality finish, perfect size to shuffle in your hands but still large enough to showcase the beautiful imagery and clear text. Luxurious gold edges and sturdy box to house them in. A must have item! Finally I have a set of Oracle cards that I can shuffle! The deck is the perfect size for me to handle and the glossy cards don’t stick together like they do in other decks. The gold edging sets it apart as a quality deck and the images are gorgeous and so easy to interpret. The pictures are supported by words so you can either do a reading by picture, by words or by both. The words also offer options for interpretation so you can use your intuition and also make sentences out of a spread, using the relevant card meaning for the question asked. The cards themselves are deceptively simple to use – it makes a great deck for a beginner but it is also a very insightful pack for someone with more experience. It is now my deck of choice. I LOVE it. I love the new Modern Oracle Deck! The cards are the perfect size for shuffling, the images are beautiful and the words written on the images make it so easy for you to interpret the messages. You can use the deck to form sentences, use as a ‘timeline’ of past/present/future or just to guide you or the person you are reading for. This deck is so straightforward and so simple to use, it is easy for beginners and also for experienced readers. I totally recommend this deck, I love it! Love the magnetic, wrap around box, the size of the cards and the absolute intention behind each image and phrase. The cards consist of modern images that really magnify the sense and meaning of each card. Every time I pick them up, shuffle through, I am constantly drawn to select cards. The cards are quite specific and speak to the heart of the matter. Katy-K is someone I trust and I love her integrity and professionalism. Her Oracle Cards are just brilliant. They are easy to use, the right size for shuffling and help you to produce incredibly accurate messages. Well done Katy-K and see you again soon!! Dear Kathryn, I recently received your Modern Oracle deck cards and they are truly a masterpiece. I love their gold edging and clear pictures . They are also combined with messages that give the most clarity to any question asked of the deck. I carry them with me everywhere & refer to them all the time. They are a true extension of yourself, Katy-K, beautiful, clear, honest & and a gift to us all. Congratulations on creating your own deck and allowing your spirit to shine. I’ve just started to read cards. My sister gave me “The Modern Oracle”. I am astounded how easy they are to hold, to use and beautiful they to look at! I love using them and carry them everywhere. Thank you for this beautiful “The Modern Oracle” deck. I love it. Great size cards, lovely pictures with accurate messages every time. I love using these cards. They are beautiful to hold, just the right small size to fit easily in your hand and do a tidy shuffle. Love the special gold edge too. They are talking to you before you look at them! Nicely illustrated and extremely accurate…that’s why I felt I should write a few comments. Well done Katy you can feel the love that went into making them. The Modern Oracle is, first of all, truly modern, and therefore relates to our current times. The cards are truly accurate in their ability to speak to all possible life situations. They are individually complex and the cards work together beautifully. Many of the cards include timings, so that one can get a sense of how a situation may unfold. The size is brilliant, smaller than others, and fits in the hand nicely. The box, with it’s magnetic catch, is great for carrying around in a handbag. I am so enthusiastic about the Modern Oracle, for personal use and to use as a tool in my psychic or mediumistic work. I am so thrilled with my Modern Oracle Deck. Finally I have found the perfect deck for me. After years of searching and buying decks that werent quite me this deck is brilliant. Easy to use. And the brilliantly designed box makes use of this deck even easier to use. This is without a doubt the last deck I will ever purchase. Congratulations to Katy-K on her wonderful oracle deck. I am really happy with my Modern Oracle deck. I have just done 3 online readings, 2 to U.S.A. and one to New South Wales using this deck. All the recipients were extremely happy with their readings and said that they helped them so much. Thank you Katy-K. The Modern Oracle is a wonderful self knowledge and development tool. I absolutely adore my deck and thoroughly recommend it to any one walking their spiritual path. I just have to say how wonderful the Oracle cards are they are so amzing and the reading are so true. Love them so much have brought some for eachof my family. I\'d like to share my satisfaction with The modern oracle deck with you. I absolutely love them !!! Like most people I was bit sceptical in the beginning as I was using other decks but after a few attempts I decided to give it a go and get them. I\'m so glad I did because they are sooooo easy to use, they are very accurate and I love the whole design of them with the pictures. Great job Katy! Since I purchased them I have not been using anything else, truly! For those who are still hesitating I\'d definitely recommend to try them. I love this deck I bought it a couple years ago and am now getting back into using cards again and this is my go to deck I just love them I can read them so easy. 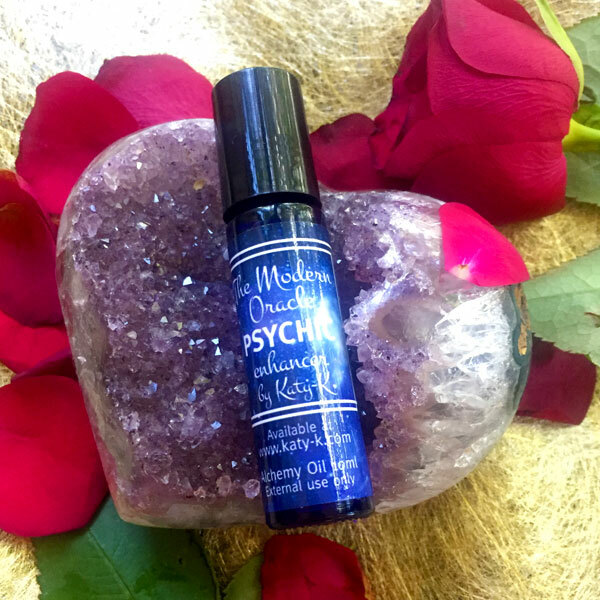 I also recently purchased the physic oil and I love it not only does it smell great but it works a treat it had my third eye pinging.